This was Dragonheart at his best, the peerless combatant. The entire Hippodrome shook as the spectators heaped praises on their favorite. He looked back confidently. Confusion ruled in the pack behind him. Then he heard another burst of applause . . . from farther down the course. With the manticores and griffins at each other's throats, the pale rider's hounds broke free and, running full out, had overtaken everyone but Zigfried. The deft achievement brought the audience to their feet. The pale rider motioned, as if to speak, but instead fell back. The dogs were bruised and breathing hard and so began to fade. The stands were buzzing, as the Dragonheart barreled ahead. With two laps to go, flags waved at him from the stands and he waved back smiling broadly. the course was his from here to the goal line. At least it would have been—if only he had not looked back again. The Warlock and Tartar had settled up and succeeded in chasing down the pale rider. At such speed they might well have reached Dragonheart, were it not for the Tartar's savage manticores. His lions broke stride to finish their grudge match with the pale rider's vexing hounds. The Warlock's griffins muscled their way to the inside and could have continued on unimpeded, had they not been drawn into the Tartar's dispute. The pale rider was completely boxed in by the two rogues, as the griffin and manticore teams viciously overwhelmed the twin hounds. Using their wings for locomotion, the griffins sank their talons into the backs of the yelping dogs while the manticores taunted the hapless animals. 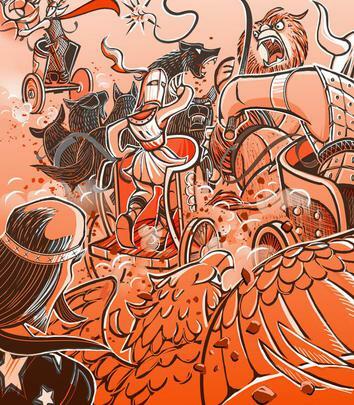 All the while the Tartar had taken whip to their master as the outmatched rider fought to maintain control of the chariot. Cheers boiled over into jeers as incensed fans voiced their displeasure. Even the villains' own boosters decried such unsavory conduct, and pelted them with hoots and hisses.